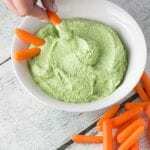 Broccoli Pesto Dip - Rich in nutrients and fun for any gathering! Broccoli Pesto Dip for the win! Try out this dip as an alternative to a high-fat, high-sodium store bought dip for your next gathering! Broccoli is one of my favorite veggies and pesto is just simply amazing. I came across a broccoli pesto dip and was basically mind blown! I knew I had to make my own and try it out. It’s safe to say I was impressed, haha! Behind the color GREEN: The natural plant pigment chlorophyll colors green fruits and vegetables. Cruciferous veggies like broccoli contain phytochemicals which may have anti-cancer properties. Woo! In addition green veggies are excellent sources of vitamin K, folic acid, and potassium. If you’ve ALWAYS thrown away the broccoli stems, this news is probably going to be one of those mind blowing times in your life. The broccoli stems actually contains the same, if not MORE nutrition than the florets. Yep. All the stems you’ve been throwing away all these years = wasted nutrition! The stalks and the florets are both very nutritious, and the stalks actually contain more fiber than the florets! But wait, how do I cook with them? Mix them into a broccoli salad or slaw, use them in a gratin, saute them, make broth, put them in a soup… or just cut them up and steam & eat them like you would with the broccoli florets. Have you ever made broccoli pesto? If not I hope you find time to enjoy this recipe! 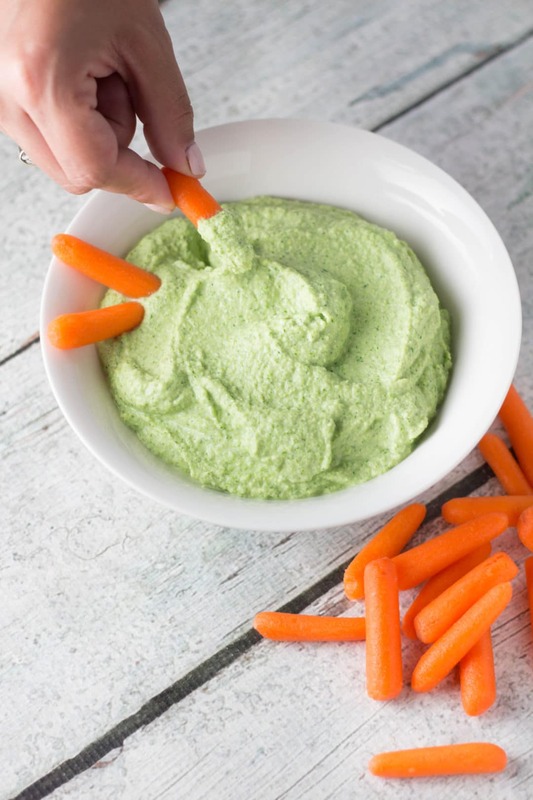 Swap out high fat dips for this light and flavorful broccoli pesto dip! Pro tip: this is great as a spread on sandwiches or flatbread too! Steam broccoli for a few minutes until it is bright green but not too soft. Plunge in an ice bath to stop cooking. Remove and pat with a paper towel to dry. Purée in a blender or food processor with the remainder of the ingredients. Serve with fresh veggies, pita bread, or chips! Be sure to use the broccoli stalks too! Or save for use in another recipe because they are just as nutritious as the florets! High in calcium, iron and Vitamin C.